Samantha Miranda is a 9th grader at South Broward High who took Journalism because she has a love for photography and writing. She discovered her interest in writing when she was 12 and by reading many stories such as Dork Diaries by Rachel Russell, Samantha started to write stories. Writing is only one of the many skills Samantha has, such as drawing, photography and playing the clarinet. Writing is not the only reason why she joined the Journalism class, Samantha also wants to be more outgoing, and by going outside of her comfort zone and report stories that normally she would just stay quiet about. While she may have a small figure for a 14 year old, standing at 4’10, she has a very big personality and many talents. Her outfit choices don’t vary much and typically consist of a pair of leggings, a flannel and her trusty pair of Converse. In a family of four siblings, she is the youngest and would love to live a day in her sisters life so she could see part of her life but in a different perspective. 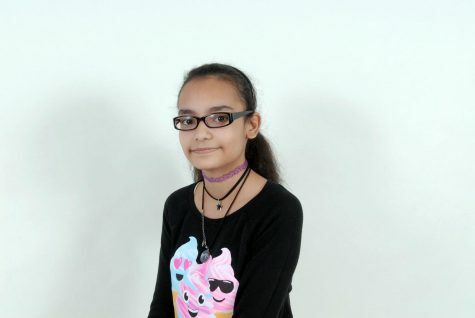 Her plans for this year are to improve on her “terrible math skills” as it is her weakness academically compared to how she does in her Language Arts class. In the future Samantha wants to be in a good path on her art career and a no brainer for her is to be an animator who writes her own story-lines too like her inspiration Rebecca Sugar.